Taken the p*ss, more like. Hopefully it will end here. I made the mistake of listening to a critic when the first one came out. I ended up seeing Shrooms. Remember that? If you don’t, you’re lucky. And DO NOT bother checking it out. When I finally got round to watching the first Taken film, I was impressed. A proper action movie. Iconic dialogue, intense action sequences and a welcome return for a very talented actor. Instant cult status achieved. The only problem with instant cult success and a shed load of money at the box office, it meant meant one thing. SEQUELS! Taken 2 was a poor retread of the exact same story line. Only in a different city and with Maggie Grace’s irritating Kim having to save Mills. NO! It didn’t help that the static camera work didn’t show any of the action properly and the dialogue was that hammy, I felt myself cringing. So, here we are. Third time’s the charm? A reprieve to end the franchise with a fiery finale? Unfortunately not. They should have left it at the first one. The trailers piqued my interest and with Forest Whitaker taking the helm as the relentless pursuer, I had hope. That was soon crushed after the drab opening sequence. So what happens in this one? 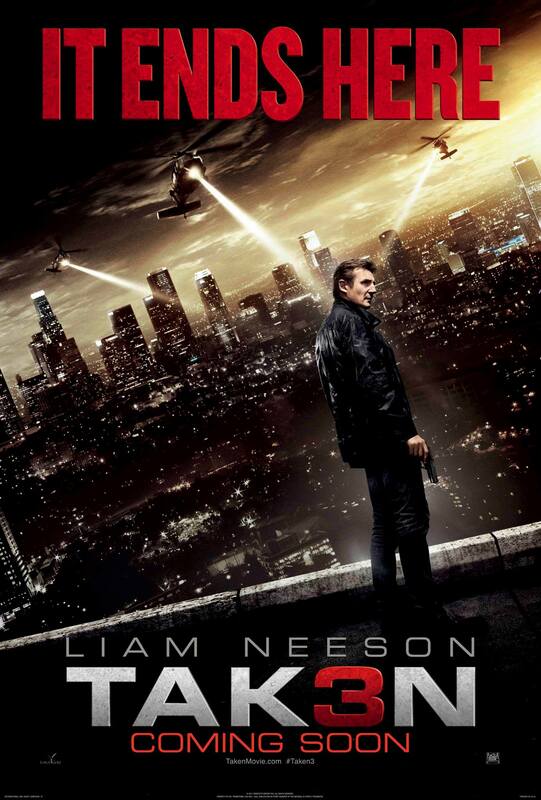 Ex-government operative Bryan Mills (Liam Neeson) is accused of a ruthless murder he never committed or witnessed. As he is tracked and pursued, Mills brings out his particular set of skills to find the true killer and clear his name. Where to begin? It was a mess. I know! It’s an action movie. Not a thought provoking, mind bending thriller. BUT still . . .
A feeble attempt at mystery came off flat and dull as Sam Spruell’s “menacing” villain (with a ridiculous Lloyd Christmas haircut) disposed of some unknown secondary characters. Dull, uninteresting . . . where’s Liam Neeson? We are then pulled through some awful and incredibly cheesy exposition between Bryan and Kim. It’s obviously become a joke. BUT a joke that was never funny in the first place. I could feel my very being sinking into the seat. Then we had the inevitable “Will they, won’t they?” spiel with Famke Janssen and Neeson. You would have thought after all their “mishaps” (two violent kidnappings that destroyed two cities) that they would have got back together. No, no, no. She’s gone and married another moronic businessman. Dougray Scott nailed the accent but was terrible as the suspiciously shady looking Stuart. However, it soon kicks off. Rather predictably if you’ve seen the heavily flogged trailers with Mills set up for murder and on the run. One thing I will commend is Eric Kress’ cinematography. A beautiful sunny Hollywood gloss over the relentless, unnecessary and OTT carnage. Olivier Megaton really needs to fire his editing team; Audrey Simonaud and Nicolas Trembasiewicz. The action was way too fast and far too frantic. The very sequence in which Mills must run from the scene of the crime was disorienting. One second, you’re looking at Neeson’s foot, his shadow, an angry dog and then a confused police man. It felt like it was overcompensating for the fact that Neeson is too old. It pains me to say that but the poor guy look jaded. Every time the sporadic shot swapping subsided, you could see he was struggling to keep up with the pace and the frantic fist fighting the film desperately tried to deliver. He did his best to add his gruffly gravitas to this disaster but even his performance felt like a parody of his own. He doesn’t even say the iconic line properly, “I have skills. You know what I can do with them”. To me, it felt like “You know what I’m going to say, you can fill in the blanks”. A shame. What annoyed me even more was the fact that he suddenly breaks into a house, finds a garage containing an old truck which is conveniently hiding an escape route to the sewers that leads to Bryan’s hidden factory fortress complete in emergency supplies. I thought switch off. It’s just a dumb action movie. Forest Whitaker is here. He’ll do something good. He pretty much plays Lieutenant Jon Kavanaugh from The Shield. At first glance. BUT he does absolutely nothing. While Mills is running around aimlessly, punching people left, right and centre. Whitaker is scoffing bagels, flicking an elastic band around his wrist (for no reason) while fumbling about with a chess piece (Steady now) in his pocket, looking confused. What a waste of a talented actor. All he does is relay the information we all know. The plot isn’t that complicated or that interesting for that matter! In fact, it’s bloody bonkers. Mills makes more elaborate and unexplained escapes than Cumberbatch’s Sherlock Holmes! He escapes a car that we saw him drive down an exploding lift shaft that seemed to blow up a whole car park complex. And somehow manages to hide behind a rock despite seeing his car rammed off a cliff and rolling into a fiery blaze. A crappy flashback makes no explanation or sense to his miraculous Houdini acts. I also felt my loyalties divided with Mills. I used to route for the big guy BUT I felt myself scratching my head at his logic. He kills and injures dozens of coppers. He throws grenades in a school. And even causes a ridiculous police chase that was completely unnecessary. Mills finds evidence that proves his innocence. Does he tell the police or show them? No! He lets them take him in for questioning. Changes his mind. Only to cause a highway pile up with heavily used CGI cars flying all over the place. Time to let old dogs lie. I think it’s time for Neeson to get back to what he did best. Acting. This affair offered no cool dialogue, no baddies of any merit, by the book action sequences with no memorable moments to recollect and . . . hammy vomit inducing exposition. Olivier Megaton, I don’t know where you are. BUT I have a particular set of skills. If you dare make another, I will find you . . .